A peek inside Linda's creative process. Commissions can be a tricky subject for artists. You want to make the client happy and you want to paint a good painting. Commissions can feel like an episode from the old TV show, Mission Impossible. Just then, your paint brush blows up in a puff of smoke. 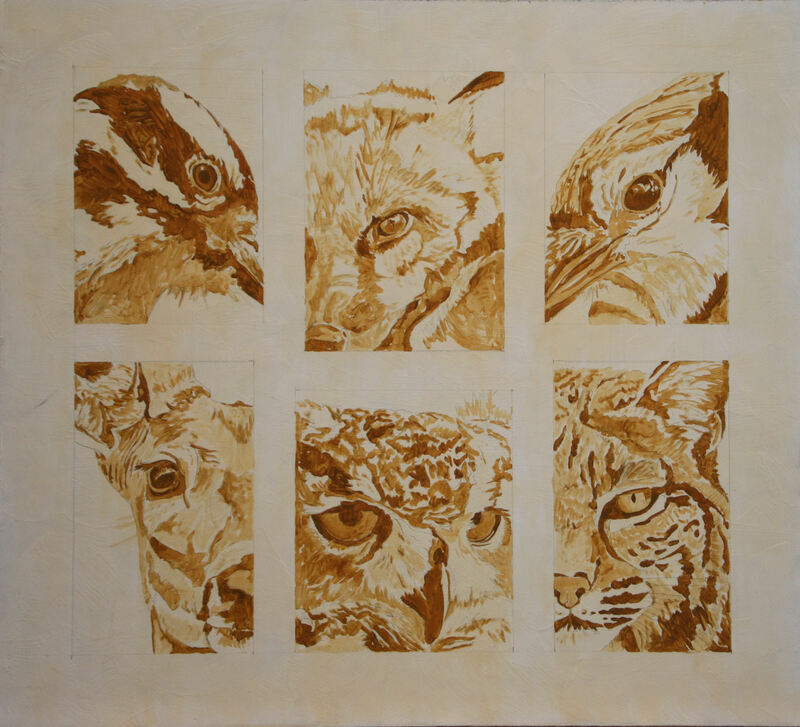 I just finished a commissioned painting from the perfect client and thought I would share the various stages of the piece. 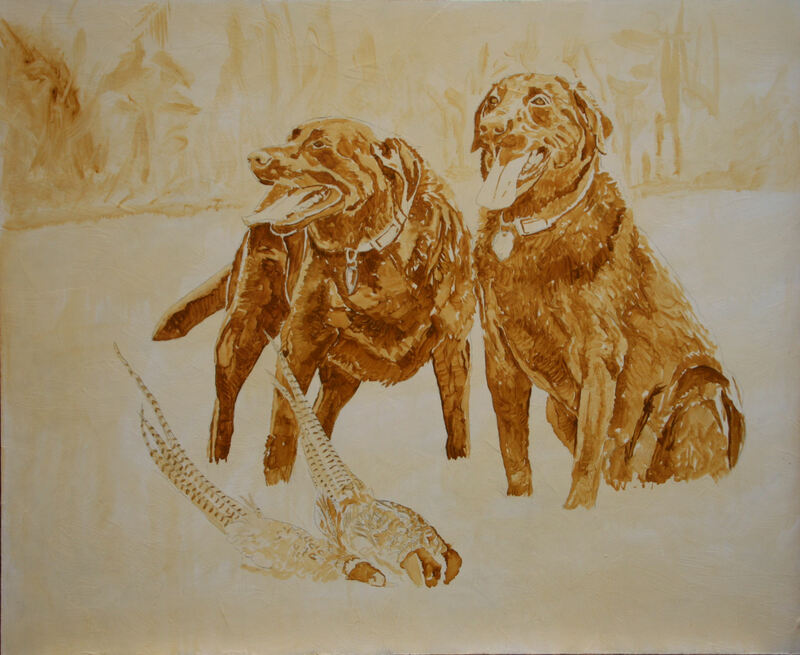 My mission: paint his hunting dogs. At first, he wasn't sure whether he wanted one or both dogs painted. Since I was going to be in his neck of the woods (on the other side of the country), I thought I would take reference photos of both dogs. By the time I got to his house, he had decided he wanted both dogs painted. 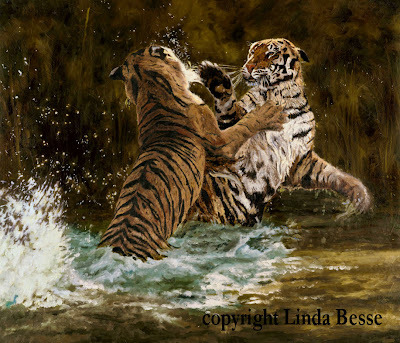 Not sure whether it would be best to have them in the same painting or in two separate oil paintings, we left that open. I would review the images I took with my camera (about 350 photos) at home and then call him. I spent a little over an hour with him and the dogs as they fetched and sat and stood for me. Being with them in person (rather than having some reference photos sent to me), gives me a much better feeling of their personalities. Once home, I spent hours reviewing every shot, making a list of the best images of the chocolate lab, the black lab, and of them together. From there, I came up with compositions for each dog and one of them together, calculated a variety of proportional dimensions and prices, and called my client. (Note: I had a number of reference shots with both dogs together, but didn't use them for the combo composition. A stronger composition was developed from several shots of each dog.) I was leaning toward a painting with both of them together, but knew I would also be happy with two separate paintings. 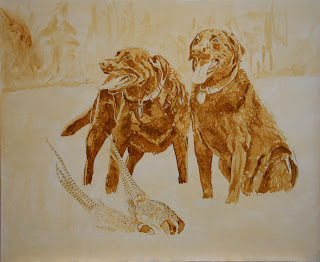 My client and I discussed the options and he chose a larger painting with both dogs. We talked about how many pheasants and whether his gun should be in the painting. What made him the perfect commission client is that he left the main painting decisions in my hand. Composition, which reference images, position of the dogs, background. He chose the size and relating price. Pricing brings up another issue. I like to charge the same for a commission as I would any comparable work. There is something I do a little differently than most artists. I don't collect any money upfront for a commission. I complete the painting and if the client likes it, he buys it. If not, (hasn't happened yet), I will sell it at some other venue. (of course that is not possible with a human portrait, but that is the chance I take.) It ends up being a no-risk for the client and in return, I receive the freedom to make critical decisions to create the best piece I can paint. Below is the start of the painting with a burnt sienna / raw sienna turpentine wash.
.......in all the old familiar places. Yeah. I am a bit punchy and am questioning who came up with this group "Eye" idea. Oh yes, that would be me. Hard to speed along on this painting. And, everyone is staring at me! Particularly spooky when I am working late at night. I just finished the whitetail buck. One of "my" deer. Well, one that visits our yard regularly. I took the reference shots out my kitchen door. He was quite photogenic and with his antlers in velvet, just what I wanted. Yes, I decided to paint each animal. Maybe sometime I will do a group with only the raw sienna / burnt sienna wash, but not this time. Eyes take me a long time to paint. If I don't get them just right, the animal doesn't come alive. Once I get the first eye right, then it stares at me and challenges me to do all the others justice! Another time-consuming aspect of this group idea was the layout. What animals should I use from the forest? What cropping? What position are they in the painting? I knew I wanted the upper left and upper right sizes to match, a longer one in the upper center and a double eye more square format in the bottom center. The bottom left and right should also match for symmetry. Let's just say it was complicated planning. I have done a number of paintings in an Eye See You series. Eye See You - Lion, Eye See You - Red-tailed Hawk, etc. In each, I work to have the eye of the animal the focus and just enough of the rest of him so you know which creature is depicted. All of the paintings have been individually framed. I thought it might be fun to group some together in one painting. My first concept for a group, Eyes of the Forest. The forest would seem to dictate a green background. Since the orange wash was not completely dry, I painted the small background for each animal and then moved on to the green. 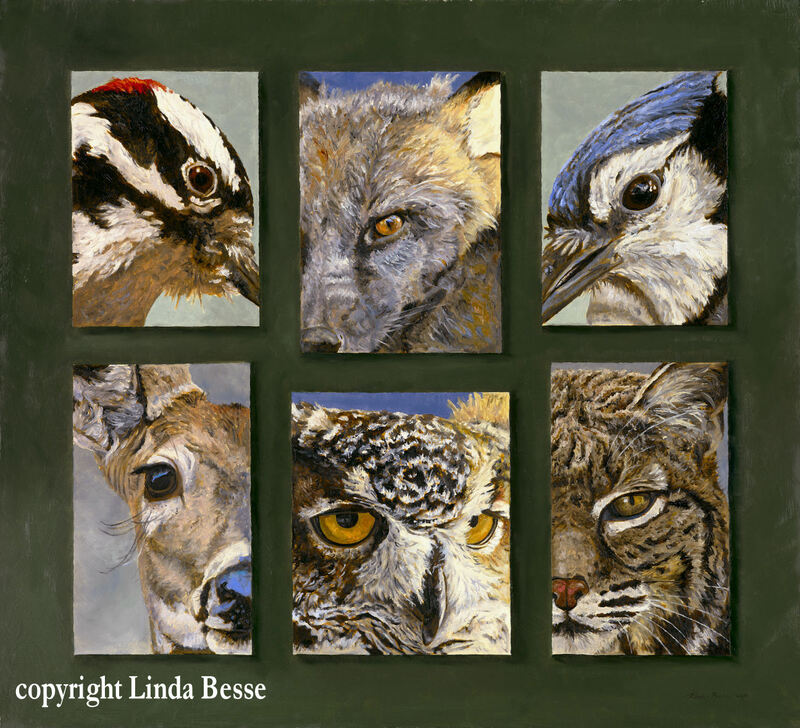 The Leigh Yawkey Woodson Art Museum has come up with a unique fund-raising vehicle for this year's Birds in Art. They are asking artists who wish to participate to draw or paint a "postcard". This is a 4" X 6" work to be sold for the incredible price of $25 at the show. One of the more interesting aspects is that no one buying will know who created the pieces because all signatures will be on the back. A line will form and the first person may choose from among all the pieces. Just one piece. If he or she wishes to buy more, he/she proceeds to the back of the line and the next person has a chance to choose from the remaining pieces. Many of these pieces would sell for hundreds (or much more). I had so much fun with my piece that I just have to share it with you. Remember, this is a secret. For the eighth time in ten years, one of my paintings has been chosen for the elite Birds in Art exhibit at the Leigh Yawkey Woodson Art Museum in Wausau, Wisconsin. This year there were 922 entries and approximately 100 works chosen with another 15 pieces from Master Artists. It is a joke among us "bird artists" about the BIG envelope. Rejections come in a standard #10 envelope, but the acceptances come in a big manila envelope. Questions fly through phone calls, twitter and e-mail once results are released. "Did you get the big envelope?" 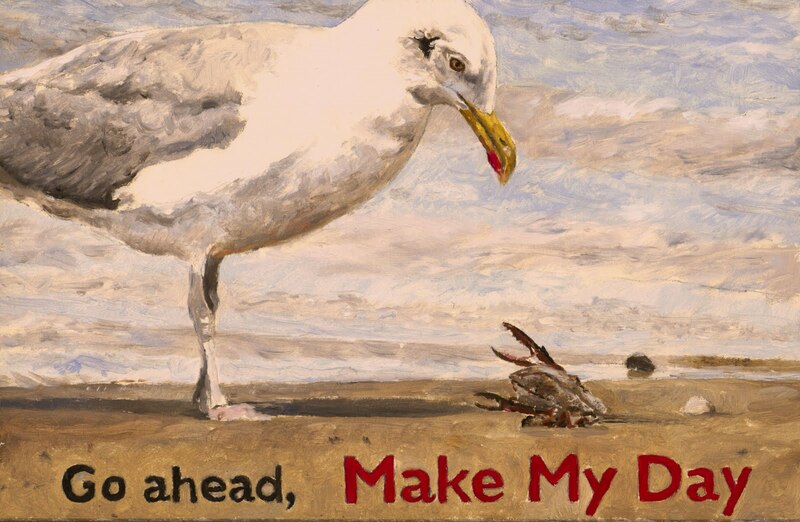 No need to preface it with Birds in Art or the Museum. We all know what the BIG envelope means. This year, to save trees that our feathery friends inhabit, the museum e-mailed the results. Very effective, a good move. And, we were able to get the results those few days sooner. But, I have to admit I miss the big envelope. Pulling it out of the mailbox. Holding it in my hand. Do I open it right now, or transit the 1/3 mile driveway until I walk through my door? I always submit two pieces and only one can be accepted. Which one did they take? There may have been one time when I waited until I stepped in the house, but maybe not. The show opens September 11th and continues until November 15th. 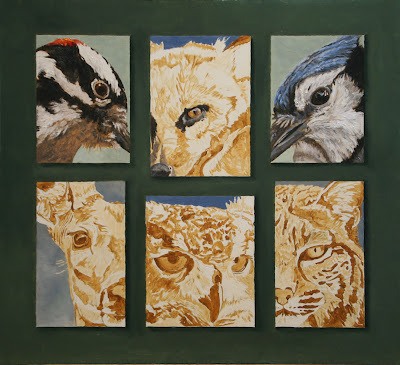 If you like birds or really good art, this is a special show. And worth the trip. 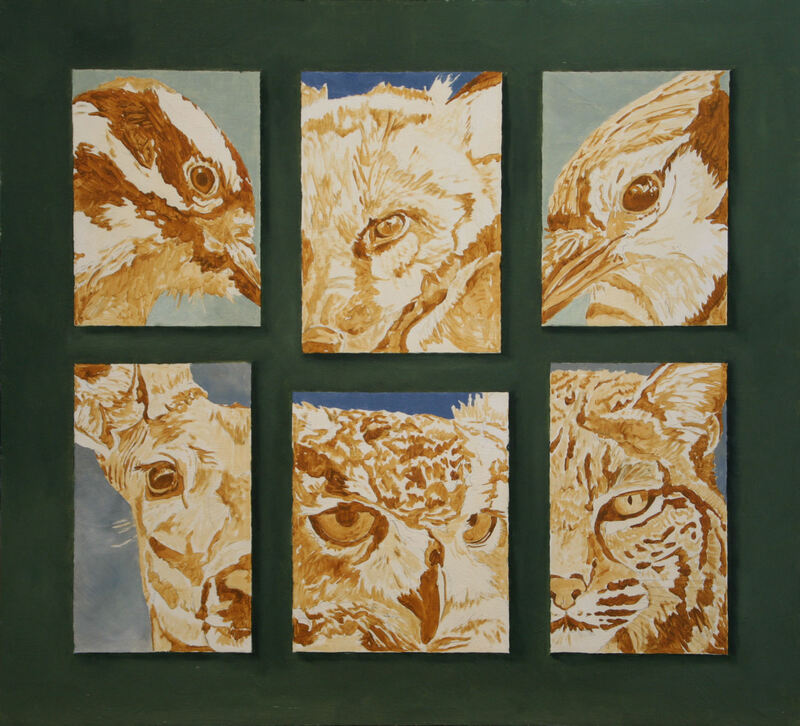 The Society of Animal Artists will be holding their 50th Annual Exhibition, Art and the Animal, at the San Diego Natural History Museum. I am thrilled my painting Battle Royale was chosen from the 434 member submissions to be part of the show. It is a large painting and will definitely take up some "wall space." The show opens September 1st and continues until October 31st. From San Diego, the entire show will travel to The Wildlife Experience in Parker, CO. 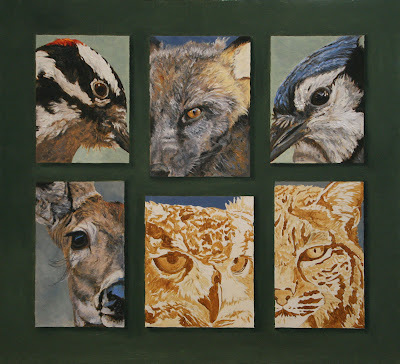 I am a Signature Member of the Society of Animal Artists. This is my 103rd blog.....and counting. I was encouraged to start blogging by artist Terry Miller. (check out the link under LINKS to his blog. His work is awesome and his blog informative and insightful.) Not knowing what to expect or write, I plunged in. Another artist Ray Brown (who also does wonderful graphite work) told me months later I NEEDED to blog more often. He was absolutely right. Since then, I have tried to post something at least once a week. While I have strived to be informative and interesting in my posts, I have found I have learned some things about my work while I have shared my process with you. 1.) I am more flexible in the midst of a painting than I thought I was. If something isn't working, I am willing to abandon it. 2.) Taking photos of paintings in progress encourages me to look more critically at a piece. I will do this more often even if it is not a painting I plan to post. 3.) I am looser AND tighter in style than I envisioned. Depending on the painting, I will lean toward one style or the other. There are surely more things I have learned and maybe I will spend the next 100 posts figuring them out. In the mean time, I hope you have enjoyed visiting this blog. I plan to keep sharing my thoughts and painting process. In celebration of passing the 100 mark for posted blogs, I have changed the look of the blog.